One of the many flightless birds which inhabit this particular area, the gidii is typically smelly, unkempt, awkward and ugly. This one is definitely typical. Vulture-like in appearance, the gidii has a wrinkled grey head and a hooked black beak. Long, dark feathers cover the awkward-looking creature from shoulder to leg, ending at thick feet with curved talons. Several sketches of gidii feathers frame the bird's chart. A ring-necked gidii squawks loudly and runs in circles until it falls in an exhausted heap. A ring-necked gidii runs in place for no reason, catches a glimpse of its feet moving up and down on the ground, is amazed at what it sees and stumbles headlong into the dirt! A ring-necked gidii lifts one foot and inspects it. Finding another still on the ground, it lifts that one as well. 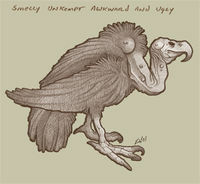 With a squawk and a chortle, it stares blankly ahead as if its being seated on its tail is some kind of cruel joke. This page was last modified on 3 May 2018, at 14:31.